A quaint old shed sits at the edge of a field of wildflowers near the village of Riez in Provence. France. Near the village of Riez in the Alpes de Haute region of Provence, France a quaint old shed adds charm to a field of wildflowers. 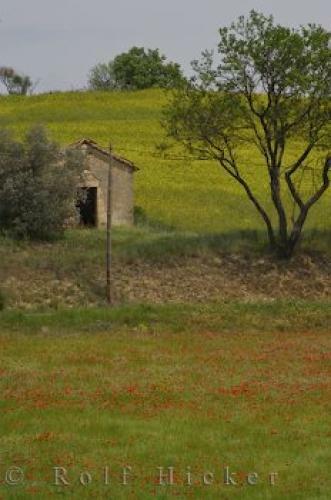 Riez is a lavender growing area, so the yellow flowers and red poppies around this shed makes a change from the mauve shades of lavender. Field of poppies backdropped by an old shed and field of yellow flowers near the village of Riez, Alpes de Haute, Provence, France, Europe. near Riez in Provence, France in Europe.